« 24. Passover – Anatolius Speaks! In an effort to counter the Quartodeciman threat, which many in the West considered a form of Judaizing, those under Roman leadership modified System D, which observed the 14th through 20th days of the first moon for the seven days of Unleavened Bread. Under their new system (System E), as with System D, they retained the Sovereign’s day—the first day of the week during the seven days of Unleavened Bread—as the time to celebrate the mystery of the Eucharist. Yet, major changes came in three areas. • Second, the advocates of System E made a decision to adopt the Hasidic construct for the seven days of Unleavened Bread (i.e., counting from the 15th until the end of the 21st day of Abib). However, they discarded the Hasidic interpretation to always observe the 15th and 21st of Abib as high Sabbaths. • Third, they adopted the Hasidic interpreta­tion that the 15th of Abib was the correct day for the legal Passover supper found in the written Torah. The ramifications of these changes were far-reaching. In the present post, we shall open our examination of those Christian systems that adopted the Hasidic view of the seven days of Unleavened Bread with a discussion of (1) the time frame and (2) the originators of the System E construct. Then in the following post, we shall document the mechanics of System E and examine other Hasidic-based Christian systems that followed. The time of change, when the western assemblies moved from System D to System E, occurred in the second half of the first century C.E. As we have already noted, the earliest advocates of the western view (System D) calculated the seven days of Unleavened Bread from the 14th day until the end of the 20th day of the first moon, a view that was itself Quartodeciman-based. Yet, unlike the Quartodecimans, they observed a Sunday-only celebration of the Passover Eucharist. The heart of the attempt to persuade other western and the eastern assemblies to leave the Quartodeciman system rested entirely upon very strong anti-Jewish rhetoric and the claim that the day of the resurrection was a much happier occasion to celebrate the mystery of the Eucharist. To solidify this view, the Roman bishops converted the Friday and Saturday preceding Passover Sunday into fast days. Yet, these arguments were simply not strong enough to bring the Quartodecimans into the western camp. In the latter half of the second century C.E., the East still remained strongly Quartodeciman. In the eyes of the leaders of the Roman assembly, it became a time for change. The leadership of the Roman assembly realized that they could only gain political dominance over all of these other assemblies if the greater Assembly4 was unified in its doctrines. Therefore, it was necessary for them to find a stronger basis for dismissing the 14th as the day of the Passover. The result of this activity was the development of a newer construct for keeping the sovereign’s Passover of the resurrection—System E, which argued that the Passover could only be kept from the 15th to the 21st days of the first month. To further dismiss the Quartodeciman practice for celebrating Passover on the 14th, the accusation was made that those observing the 14th were committing an act of Judaizing. The leader of this new movement is uncovered in the following way. Columbanus of Luxovium, who advocated System D, bitterly testified in a letter to Pope Gregory, dated to the year 598 C.E., that the culprit behind this innovation to dismiss the 14th as a day to observe Passover and charge it as being an act of Judaizing was Pope Victor of Rome. Under the guiding hand of theoreticians Victor of Rome and Irenaeus of Gaul, and with the agreement of others like Clement of Alexandria, the western assemblies did an about-face and accepted what had previously been shunned—i.e., the Hasidic premise that the seven days of Unleavened Bread extended from the beginning of the 15th until the end of the 21st day of the first moon. The System E concept was developed as a result of the controversy which followed the visit of the Quartodeciman Polycarp of Smyrna, leader of the eastern assemblies, with Anicetus, the bishop of Rome and leader over several of the western assemblies. 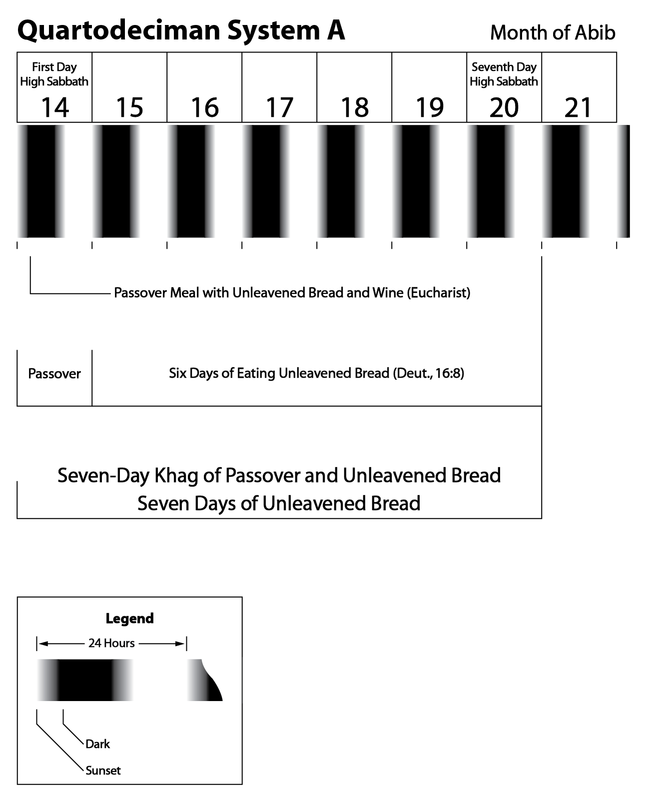 It was with this dispute that we hear for the first time of a difference between the observance of the 14th as the historical Passover and the western observance of Passover Sunday (System D) being practiced at Rome. It was no earlier than 158 C.E.,6 and probably shortly thereafter, that these two bishops tried to resolve their differences over the Passover issue. At the same time, members of the Roman assembly saw Polycarp’s unwillingness to censure or excommunicate Anicetus as a sign of weakness. Polycarp’s inability to convince the leadership of Rome, therefore, became the first major step on the road to political dominance for the leadership of the Roman assembly. Perceiving that they were now unfettered and justified in their approach, the Roman assembly began a major campaign to expand their power. Some were, for the first time, pleading an interpretation of the story of the messiah’s suffering that reflected a strong Hasidic influence. This disagreement reveals the beginning of an effort by those who were trying to introduce the Hasidic construct, which makes the 15th the first day of Unleavened Bread and a high Sabbath, into the Christian Passover debate. Shortly thereafter, in approximately 170 C.E.,17 Apollinarius, who was from the city of Hierapolis (located near Laodicea in Asia Minor), also wrote in defense of the Quartodeciman view. As a result of the Quartodeciman counter-attack, those holding to the early western view (System D) sought for a stronger argument. Under the leadership of Victor, bishop of Rome (192–202 C.E. ), a major effort was made by the Roman assembly to gain doctrinal supremacy in reference to the Passover. At that moment, the Roman assembly system of fasting for the two days before Passover Sunday had attained supremacy among the western assemblies. At the same time, the agreement to observe the Friday and Saturday fast before Passover Sunday was also an acceptance of a very different way of celebrating the suffering and resurrection of Yahushua. 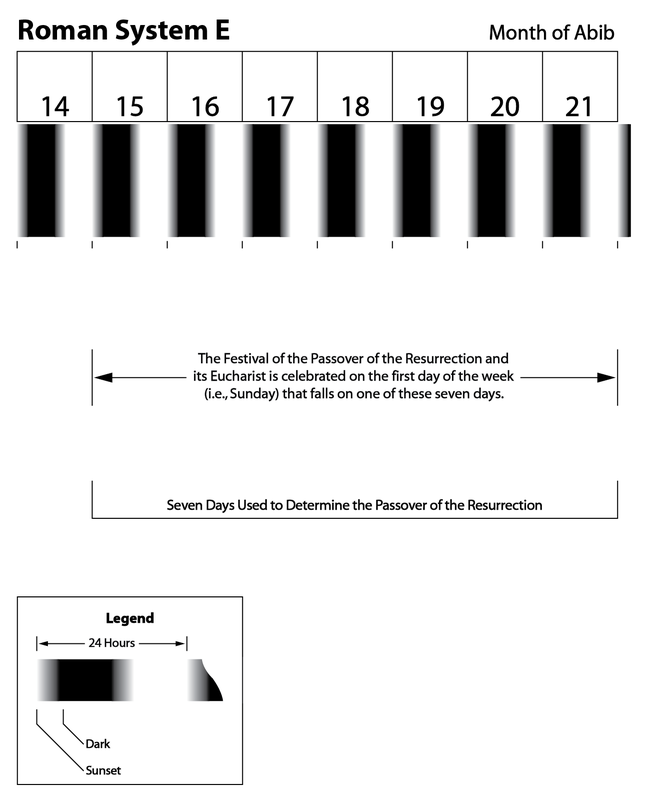 Instead of annually celebrating the Passover on the 14th and the following Sunday as the Sovereign’s day, this new system always celebrated the same three-day sequence: Good Friday represented the day of the messiah’s death, Saturday his time in the grave, and Sunday was the day of his resurrection. The annual observance of the day of the messiah’s death and his time spent buried in the grave was no longer based upon the exact day of the month, regardless of which day of the week they fell upon. This was the Quartodeciman system and it was controlled by the 14th of Abib. Instead, the new annual observance was based upon the exact day of the week, regardless of which day of the month it fell upon. Under this formulation, since the messiah was raised on the Sunday following Passover (the 14th), the messiah’s death should annually be observed on the previous Friday and his resurrection on its proper Sunday. Under this Roman system, the days of Passover were controlled by the anniversary of the Sunday resurrection. The most important change instituted by the new Roman system of Passover was the introduction of the Hasidic system for the seven days of Unleavened Bread, i.e., from the 15th to the 21st day of the first moon. The 14th was retained only for the purpose of determining when the first month of the year should be fixed (i.e., the vernal equinox must fall before the 14th day of the first moon). Due to the many conferences held on the matter, several bishops of the important Christian center at Alexandria, Egypt, such as Clement of Alexandria and Origen, quickly agreed. Included in this decision with Victor was Theophilus, bishop of Caesarea, and Narcissus, bishop of Jerusalem. The political shift in the days of Victor was now fully evident. This episode reflects the changing position of the Roman assembly leadership toward intolerance. When Polycarp of Smyrna, leader of the eastern assemblies, visited with Anicetus, the bishop of Rome, in about 158 C.E. and argued that the Roman assembly should change its position in the name of unity, Anicetus utterly refused. Both sides agreed to disagree and toleration of each other’s view of Passover was encouraged. With Victor and the events of 196 C.E., on the other hand, the Roman assembly saw its chance to suppress the older Quartodeciman view. Instead of toleration they moved toward an act of excommunication. This new attitude of the Roman leadership would eventually win the day. When Emperor Constantine, in support of the Roman assembly, held the Council of Nicaea in 325 C.E., the suppression of all other Christian Passover systems became the official Roman Catholic policy. Time to wrap up Part I of our discussion and take a break. In our next post we will address the main protagonists of the Roman System E, namely Irenaeus, Clement of Alexandria, and Origen. Be sure to continue reading with 26. Passover – Roman Corruption II. 1 See 23. 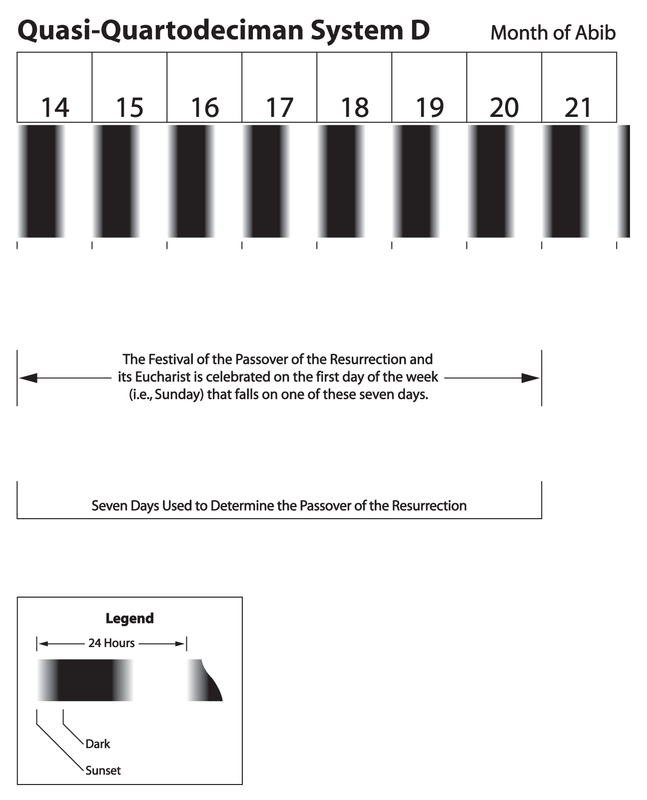 Passover – Which 7 Days?, subhead, Common Apostolic Source. 2 The observance of this fast was at the heart of the differences between Polycrates, bishop of Ephesus and leader of the Asian assemblies, and Victor, bishop of Rome, in 196 C.E. (Irenaeus, frag. 3; Eusebius, H.E., 5:24:11–16). 4 The Greek term ἐκκλησίᾳ (ekklesia), Latin ecclesia, shall be translated throughout as “Assembly,” if the reference is to the world body, and as “assembly” if the reference is to a local congregation (see GEL, 1968, p. 509; SEC, Gk. #1577). The Hebrew term behind the Greek and Latin is קהל (qahal), קהלה (qahalah), “an assemblage:—assembly, congregation” (SEC, Heb. #6951, 6952; HEL, p. 228; cf., CS, 1, p. 433). The English term “Church,” which is often used to translate the Greek and Latin words, is misleading in that it gives a connotation of a building for public worship as well as for the congregation. 6 Anicetus did not obtain the bishopric of Rome until early in 158 C.E. 7 Polycarp died after living as a Christian for 86 years (Polycarp, 9; Eusebius, H.E., 4:14:3f, 4:15:20). He was converted as a young boy (Pionius, Poly., 3) and, based on various other factors (see FSDY, App. F and App. G), he was at least 99 years old at his death. 8 Eusebius, H.E., 5:24:14–17; Irenaeus, frag. 3; Socrates Schol., 5:22. 9 This attitude is clearly expressed by later writers such as Irenaeus, frag. 3; Eusebius, H.E., 5:24:14-18; and Socrates Schol., 5:22. 10 Roman assembly influence over the bishops of Palestine is clearly expressed by the willingness of Theophilus, bishop of Caesarea, and Narcissus, bishop of Jerusalem, to join with Victor in the Passover controversy. 11 For the date of Polycarp’s death see FSDY, App. F and App. G.
12 Melito, frag. 4, writes, “Under Servillius Paulus, proconsul of Asia, at the time when Sagaris bore witness, there was a great dispute at Laodicea about the Passover, which had coincided according to season in those days.” The most likely date, as discussed by Stuart G. Hall (Hall, Melito, pp. xxi-xxii), is the year 166/167 C.E. (May reckoning). Since this event coincided with the season in those days, we would understand that the debate took place in the spring of 167 C.E. Also see Eusebius, H.E., 4:26:3; cf., EEC, p. 141, 26. n. b; JTS (NS), 24, p. 76; JTS, 25, p. 254; BCal, p. 160. 13 Chron. Paschale, 1, pp. 13f; cf., EEC, p. 141, #26, n. b. 14 Chron. Paschale, 1, pp. 13f. 15 Eusebius, H.E., 4:26:1-3, which dates the work, “In the time of Servillius Paulus, proconsul of Asia, at the time when Sagaris was martyred” (i.e., c.164-167 C.E. ; see Lake, Euseb., i., p. 387, n. 7). 16 That Melito supported the Quartodeciman view see Eusebius, H.E., 5:24:5. 17 JTS (NS), 24, p. 76. 19 Eusebius, H.E., 5:23:2. With regard to the importance of the fast see above n. 2. 20 Jerome (Euseb., year 2212) associates this debate with the fourth year of Emperor Severus (196/197 C.E., May reckoning). 22 See discussions in this and the next post. 24 Lib. Pont., 15. Cf. BPLP, p. 6. 26 Eusebius, H.E., 5:22:1-5:23:4, 5:25:1, which shows that Narcissus and Theophilus were in communication with the assembly in Alexandria, Egypt and established agreement between them on how to observe the Passover. For Hadrian’s ban against ethnic Judaeans in or near Jerusalem see Eusebius, H.E., 4:6; cf., Dio, 69:12–14; Orosius, 7:13. This entry was posted on 02/09/2013, 9:57 am and is filed under Calendar, Easter, Feast Days, High Sabbaths, Holy Days, Passover, Quartodecimans, Religion, Scriptural Calendar, Tekufa, Tekufah, Tequphah, Tequphath, Unleavened Bread, Vernal Equinox, Yahweh. You can follow any responses to this entry through RSS 2.0. You can leave a response, or trackback from your own site.